Two fantastic AC Propulsion powered EVs - The Peraves E-Tracer #7009 and Luxgen eMPV with Stefano Paris at the AltCar Expo ACP booth. The X PRIZE winning E-Tracer #79 safely made the 2600mi journey across the USA to arrive at AC Propulsion in San Dimas, California Wednesday evening. Roger, Désirée, and I spent Thursday detailing and preparing the E-Tracer for AltCar Expo. We delivered #79 to the Civic Center Thursday evening with Roger driving it the 50 miles from San Dimas to Santa Monica. We lucked out with a zippy traffic-free drive with the E-Tracer averaging a very efficient consumption of only 117Whr/mi. After staging the E-Tracer at the AC Propulsion booth alongside the ACP powered Luxgen eMPV, we walked to dinner along the beautiful Santa Monica coast. Come check out the X PRIZE winning E-Tracer at AltCar Expo from 10am-5pm this Friday and Saturday! San Dimas, Calif. (Sept 29, 2010) – The Peraves E-Tracer, powered by AC Propulsion’s state-of-the-art electric drive system and winner of the 2010 Progressive Insurance Automotive X PRIZE, Alternative Class (Tandem) award, will make its debut October 1st and 2nd at AltCar Expo 2010, in Santa Monica. The tandem two-seat design of the Peraves E-Tracer combines the best of motorcycles and automobiles and features two outrigger wheels that deploy at low speed. AC Propulsion will also display the LUXGEN EV+, the product of its partnership with YULON Group in Taiwan. Limited production of the LUXGEN EV+ started in September. AC Propulsion will also be offering test drives of its eBox, an electric vehicle conversion of a Scion xB. The E-Tracer powered by AC Propulsion’s tzero™ AC induction motor boasts 204 horsepower (150 kilowatts) and 162 ft/lbs torque. The lightweight design and powerful electric motor allows the E-Tracer to accelerate from 0-60 in less than five seconds and reach a top speed of 155 miles per hour (electronically limited). As tested in X-PRIZE competition, the E-Tracer can deliver over 220 MPGe (miles per gallon energy equivalent) in simulated highway driving and proved to be a clear winner for the $2.5 million 2010 Progressive Insurance Automotive X PRIZE class award. Based in San Dimas, Calif., AC Propulsion provides propulsion systems, engineering services and technology licenses to automotive and transportation clients throughout the world. In 1997, AC Propulsion introduced the original tzero™ sports car which reached performance milestones of 0-60 mph in 3.6 seconds and a range of 300 miles. In 2004, Tesla Motors licensed the tzero™ technology to propel the Tesla Roadster, which launched in 2008. AC Propulsion is also responsible for creating the eBox, the world’s first vehicle-to-grid (V2G) capable electric vehicle, which debuted at the first AltCar Expo in 2006. In 2008, AC Propulsion partnered with BMW Group to supply electric propulsion and battery technology for 600 MINI E electric vehicles. Today, in addition to its partnership with Peraves for the E-Tracer, AC Propulsion is working in tandem with AutoPort to provide an electric vehicle conversion prototype for United States Postal Service for the possible conversion of its 142,000 Long Life Vehicles (LLVs) to plug-in Battery Electric Vehicles. AC Propulsion is a global leader in the development, design and manufacture of electric vehicle technology. AC Propulsion’s proprietary tzero™ technology is a complete solution for electric vehicles, and can be customized for every class of electric vehicle, from a sports car to an SUV to an 8-ton city bus. AC Propulsion is also a leader in the development of Vehicle to Grid (V2G)- capable vehicles, as well as the research and development of V2G technology. For further information, please visit http://www.acpropulsion.com, or 951-719-1040 or 310-392-1130. 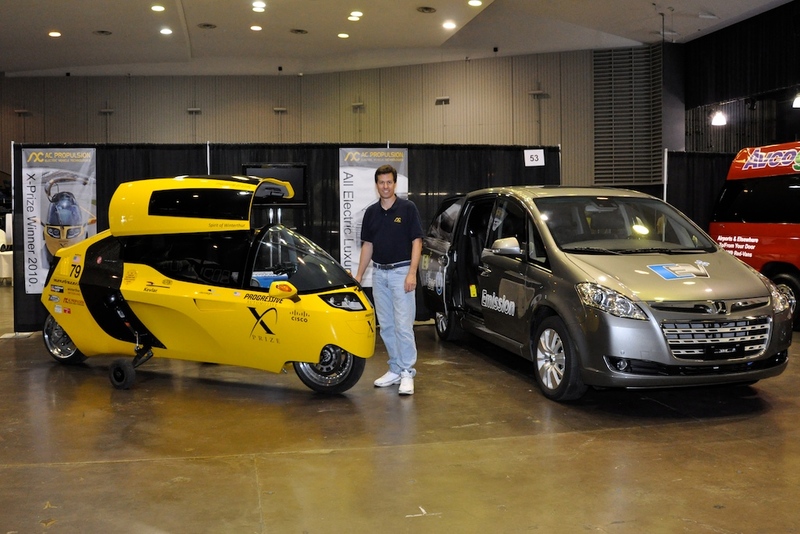 The fifth Annual AltCar Expo will debut new alternative cars on Friday and Saturday, Oct. 1 and 2, 2010 from 10 a.m. – 5 p.m. at the Santa Monica Civic Auditorium. Some will be seen for the first time and others will be available to ride and drive for the first time. AltCar Expo is presented by the City of Santa Monica and is free and open to the public. This entry was posted in Peraves and tagged AC Propulsion, AltCar Expo 2010, CA, E-Tracer, PIAXP, Santa Monica, X PRIZE. Bookmark the permalink. Wish I could be at Alt Car to see the E-Tracer®! It will be at the PIA fundraiser, I hope!